He is pretty much spot on in asserting that negative interest rates have a deflationary impact. Negative interest rates are essentially a tax as they strip interest income out of the economy and force banks to raise revenue in other ways to make up for having to pay to have some of their assets held by the central bank. Banks can always access reserves to lend to qualified borrowers. They may be capital constrained, but they are not reserve constrained. The primary constraint is finding willing, credit-worthy borrowers that are profitable for banks to lend to. In this more highly regulated environment, however, it’s often not very profitable to lend money to certain types of borrowers due to the high capital reserves required to be held as a potential cushion against losses. This serves to make the system safer but also results in slower growth. Negative rates are not going to result in banks rushing out to make new loans to borrowers that do not meet their criteria. Canseco is right in saying that 2% inflation will not be generated by this policy. The incredibly powerful headwinds of terrible demographics are the main force behind lower interest rates in Japan. Forcing them lower will not stimulate inflation but will reinforce the deflationary trends that have been in place for decades now and will continue to be the case for many years to come. 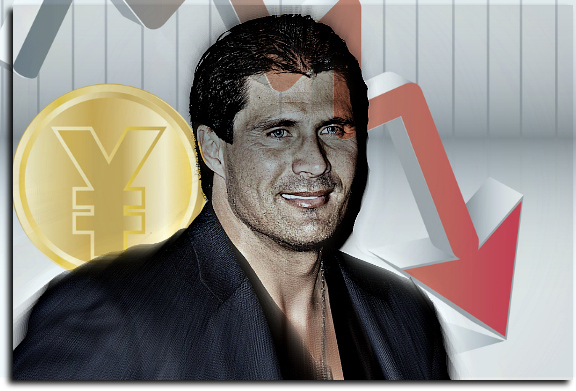 Is Jose Canseco Turning Into Yogi Berra? Perhaps Jose Canseco could be turning into the modern day Yogi Berra who was famous for some of his nonsensical, but brilliant statements. Many of these Yogisms have great applicability to investing. Many investors have a bias towards taking action and they respond very emotionally to feelings of fear and greed. And yet, much can be learned by studying how markets work, particularly at extremes, which can hopefully allow one to reflect first and act second. Investing is not an easy endeavor because we are often times are own worst enemies. If we can take the opportunity to step back and reflect and observe what conditions have been in place in the past when madness took over and when we find ourselves being sucked in out of the desire to make easy money or we want to sell due to extreme fear of losing money because everyone else is selling in a panic, we might be able to avoid permanent loss of capital and take advantage of tremendous opportunity. Keeping cool and a detached demeanor may result in changing one’s financial results quite impressively over the course of a lifetime. So when does one act? Decision points are inevitable in life. The key is to know when to act to avoid permanent loss of capital or to take advantage of an opportunity. There will be a point where we have to go in one direction versus the other. In the aftermath of the Great Recession, we believed that home ownership was going to drop quite significantly and demand for renting would fill the void. We acted aggressively by purchasing many apartment communities and our investors have prospered as a result. We came to a fork in the road and took a path. I mentioned above that one of the points of observing and then taking action is to avoid losing money. What did Yogi Berra say about this? Winning in investing and in life often comes from not losing. Warren Buffett always prided himself on how much less he lost than others during bear markets. It was protecting capital during downturns versus doing better than the crowd in bull markets that has led to Berkshire Hathaway’s extraordinary track record. It is so important to focus on downside protection first and then evaluate the upside potential. 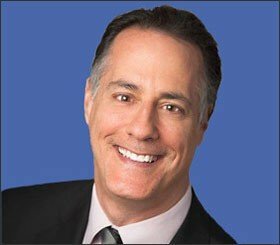 In the world of investing, particularly in real estate, so much of one’s ability to make money is to have the staying power during the downturn. When times get tough, one needs the financial resources and emotional fortitude to stay with investments that are temporarily impaired but have compelling long-term earning power. The best real estate is not immune to the effects of an economic downturn, but it almost always come out of the downturn into the recovery phase worth more provided one can hang on during the turbulent ride. What did Yogi Berra say about this? We have great nostalgia for the past and tremendous worries about the future. And yet today is yesterday’s future and our economy and society have an uncanny way of improving standards of living and opportunity for growth decade after decade. The future is unknowable because it obviously hasn’t happened yet. And yet, that doesn’t stop people from putting their heads down, focusing on their strengths, and doing what is necessary to improve their lives and economic well-being in ways that benefit society in totality. Of course, there are people who are marginalized and we have many problems, but it is hard to argue that most of us don’t have more opportunity and choices available to us today than 10 years ago and 10 years before that. Yes, the future ain’t what it used to be, but it will most likely be better than today. What surprised you the most? 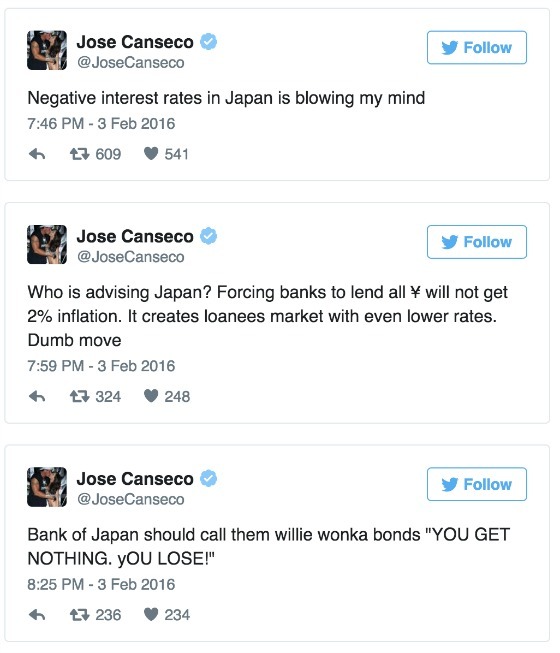 Jose Canseco is able to impart wisdom similar to Yogi Berra’s – OR – that Japan adopted a negative interest policy? Gary nice commentary and I always enjoy a jocks point of view. Yogi is one of my heroes, not so much Jose…..